NIU junior Mackenzie Thompson knows that her experiences working with NIU’s P-20 Center will come in handy no matter what career she pursues. As an instructor at the Center’s STEM Outreach camps and STEM Saturdays, she’s learned firsthand the rewards of bringing science, technology, engineering and math into kids’ lives. 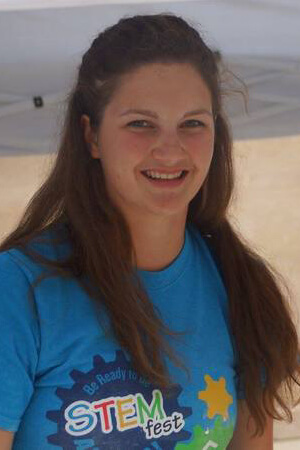 Thompson, a mechanical engineering major, has taught at camps for both middle and high school campers. She worked both as a volunteer and as a student employee at the STEM Saturdays program, where she was mentored by STEM Educator Pettee Guerrero, learning how to translate STEM concepts to young audiences while keeping their attention. Girls ages 7 to 11 who are regulars at STEM Divas on Saturdays and during the summer are Thompson’s greatest fans. With her engineering degree, Thompson hopes to find a job in a STEM-based industry. But she hopes to land at a company that takes STEM education seriously.